Used office furniture can save your business in the Mississauga, Ontario, area a good deal of money. Instead of spending large sums on brand-new items, you can invest less money and still furnish your office with beautiful and stylish products. 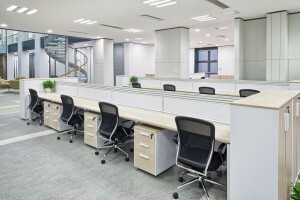 Saving money on used furnishings for your office in the Mississauga, ON, area doesn’t mean sacrificing in quality, though. You can turn to Reusable Office Interiors and receive top-of-the-line products that are stylish and built to last. The gently used and refurbished office furniture we sell comes from popular manufacturers like Herman Miller, Haworth, Teknion, Knoll, and Steelcase, so you can get the furnishings you want at a price you can afford. When you turn to us for your used furniture needs, you’ll be able to pick from a wide selection of desk sets, cubicles/workstations, file cabinets, conference tables, and so much more. We also provide outstanding services to ensure that you have an easy time updating your building. Our skilled and friendly specialists can deliver and install all of your furniture so that you don’t have to worry about any of the logistics. Our associates can also help manage the entire renovation process from start to finish and even help design an aesthetically pleasing and functional office space for you. To learn more about the outstanding selection of used office furniture we have for business owners in and around the Mississauga, ON, area, contact Reusable Office Interiors today. One of our knowledgeable associates is available to answer any questions you have.